"The stain of this offense is very severe," said Judge T.S. Ellis of the U.S. District Court in Alexandria, Virginia, while sentencing Darlene Druyun this morning. Druyun, also known as the Dragonlady for being a tough negotiator, was the second-most senior Air Force procurement official and, while overseeing billions of dollars of Air Force contracts, was involved in discussions with Boeing for a $250,000-a-year job. She was sentenced to nine months in prison, a $5,000 fine, three years of supervised relase and 150 hours of community service. Druyun (who referred to herself as the "Godmother of the C-17") pleaded guilty to conspiracy to violate federal conflict-of-interest regulations on a technical basis. That is, she initially admitted only knowingly violating regulations, but not to using her position in the Pentagon to give Boeing advantages. However, she failed a lie detector test and then admitted that she "did favor the Boeing Company in certain negotiations as a result of her employment negotiations and other favors provided by Boeing to the defendant," according to the supplemental statement of facts and supplemental plea agreement . Druyun helped Boeing obtain a grossly-inflated $23 billion deal where the Pentagon would lease Boeing tankers, rather than buy them (and save up to $5 billion). Essentially, she was negotiating for Boeing rather than the government at this point. Assistant U.S. Attorney Robert Wiechering said, "she did this as a parting gift to Boeing and to ingratiate herself into Boeing." For more information on the Boeing tanker deal check out our Contractor Bailout Archives and our new report The Politics of Contracting. Darlene Druyun AKA "Dragon Lady" didn't even get a slap on her hands. The $5,000 fine and nine months in jail only make her a celebrity. Michael Sears on the other hand faces a $250,000 fine and five years in jail. Why does Sears take the big hit when it was Druyun that had the position of number two acquisition official in the Air Force out for bid like a so-many-notebooks contract? As a mater of record , she even had her daughter taking bids between Lockheed and Boeing for her favors. Employment for her future son-in-law and perks. A regular all in the family con game and it was run by the Dragon Lady. She keeps her government pension and benefits, retirement when she gets out of the pen? If she does, she will laugh all the way to Aspen for the ski season. Druyun also helped other large contractors over her career as an implementer of political policy. The policies in the Clinton Administration were to favor California after the disastrous BRAC of the mid 1990s, to favor contractor accomplishment to appear to reduce government headcount even with economic penalty, and in some cases to assist the White House in promising favors or retribution. Reinventing Government needed favorable statistics while Clinton Chief of Staff Panetta helped California's aerospace economy. Druyun received civil service Persidential cash awards fostered by her cooperation with White House directions over the objections of her military bosses. Druyun forced Air Force generals to take the fall (following Congressional outcry) for her helping McDonnel Douglas (now Boeing) in a C-17 progress payment scandal and learned to reduce her paper trail using verbal direction. When she told the F-117 program manager to adjust economic analyses which showed Lockheed to be more expensive than government to provide long tern support, and he asked for written direction, he and his deputy were fired. Despite Congressional knowledge she made the demotions stick. 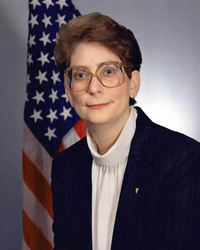 Over her career she emphasized buying support from original manufacturers rather than competing sustainment using government managers, a costly but "politically correct" move, and one that ingratiated herself to multiple large businesses (potential employers) to the detriment of government and smaller businesses. Only later in her career, approaching retiement, did she decide to favor Boeing exclusively, not just coincidental to her daughter's employment with them (at formerly McDonnell Douglas in St. Louis). Her Relationship with Harry Stonecipher, current Boeing CEO because of the firing of those involved with Druyun's hiring scandal last year, extends back to the C-17 bailout. A whole group of politicians and former government employees, along with contractor personnel should be very nervous as to what Druyun miight be willing to say to reduce her sentence! She was indeed a Dragon Lady whose firey breath burned people and tax dollars.